Flashing back to December for this post, which I never got around to writing because it was just two days before Christmas when we went. I’m a bit of a Harry Potter geek (we still took a vacation to London last June even though we were moving here a month later because before we knew we would be moving here I’d gotten tickets to the brand-new Harry Potter and the Cursed Child play on the West End and I wasn’t going to give those up), so I was really excited to go to the film studio where they made all eight movies. The studio lot is in Leavesden, which is not too terribly difficult to get to from London, unless there’s a train strike, which of course there was. Three transit transfers later, we made it to the train station, where you then catch the Harry Potter shuttle bus to the film studio. We left E at home with a babysitter that day, which was a good call. I did take Baby R along, and she obligingly slept in her buggy for most of the time, and there was a nice Mother’s Room available for nursing and changing. The cupboard beneath the stairs (not the Mother’s Room, thankfully). The set designer actually sourced some of the items in Harry’s closet bedroom from her own basement. The self-guided tour is supposed to take about 3.5 hours, but we spent longer, and I probably could have spent a whole day if we hadn’t had to get home to the babysitter. Everything was so amazing and I wanted to inspect everything closely, read every placard, and watch every video. 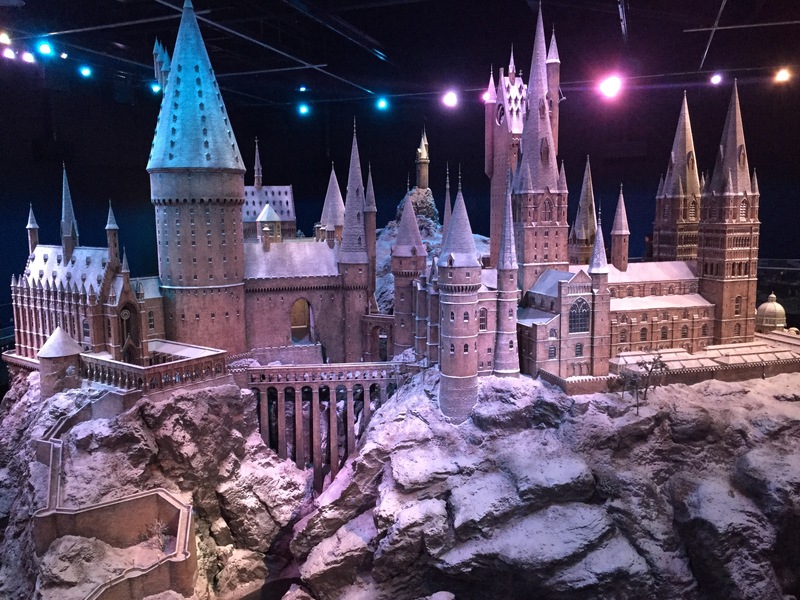 If you are a Harry Potter fan and come to London, this is definitely worth a half-day trip. You get to walk through portions of the actual set they used for the films; the ones they didn’t blow up, anyway: Platform 9 3/4, Hogwarts’ Great Hall, Privet Drive, Gryffindor Common Room and boys’ dormitory, Potions classroom, the Burrow, Dumbledore’s office, Hagrid’s hut, and more. You get to see tons of props and learn about the incredible detail that went into each one (something like 17,000 individually hand-lettered wand boxes were made for Ollivander’s shop, and then most were destroyed in an explosion). As an animal lover, I was fascinated to learn about how they trained the various animals (it took six months to train an owl to carry a broomstick and drop it to Harry). You learn secrets about how they made the moving portraits, the Great Hall’s enchanted ceiling, snow, fire, and other special effects. 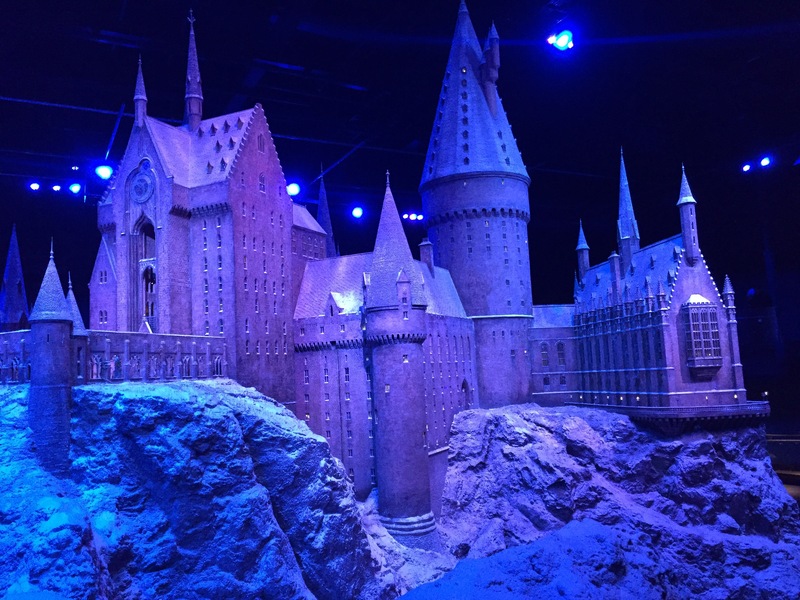 You see the model of Hogwarts, which is the only Hogwarts exterior ever built. You can make a broomstick jump up into your hand by saying “Up!” and pretend to ride one (and purchase the souvenir video, of course). 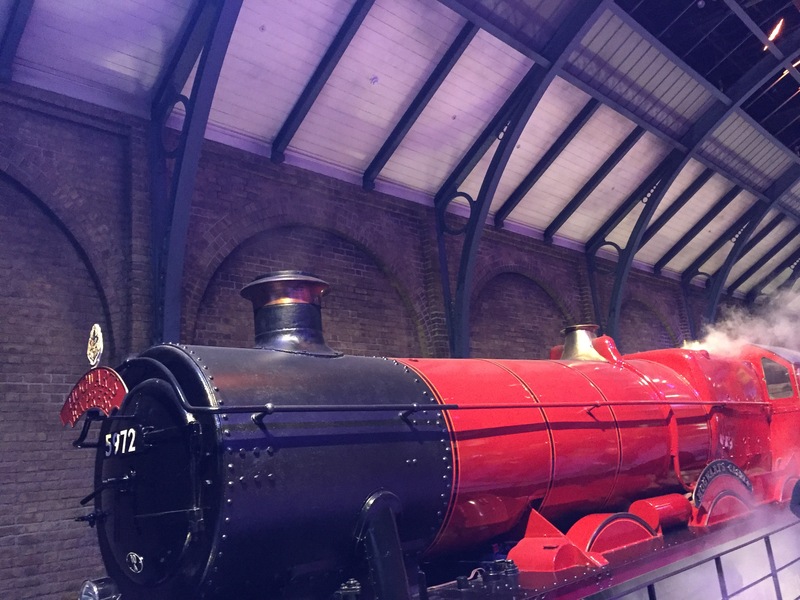 You can walk through the Hogwarts Express train and down Diagon Alley. 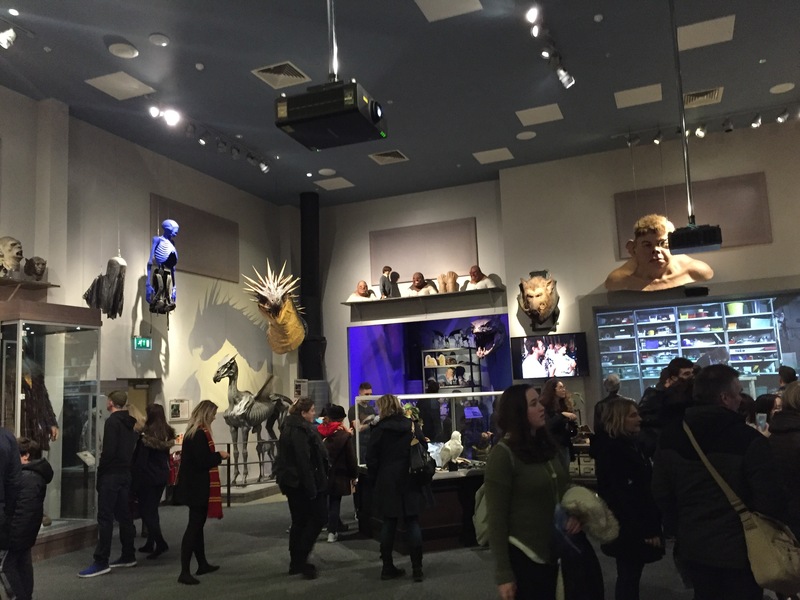 One of my favorite parts was the creature workshop, where we saw the amazingly lifelike animatronics, prosthetics (like for the goblins at Gringotts), and other cool things they built and learn about how they worked. A lot of the animatronics were operating so we could see just how lifelike they really are up close. I had no idea how they made Hagrid appear so large; I thought it was all just camera tricks. But in fact, for scenes when he appears next to other people at full scale, it’s an extremely tall man on stilt shoes in a big padded costume with an animatronic head on top! The animatronic head looks just like the actor, it’s incredible. 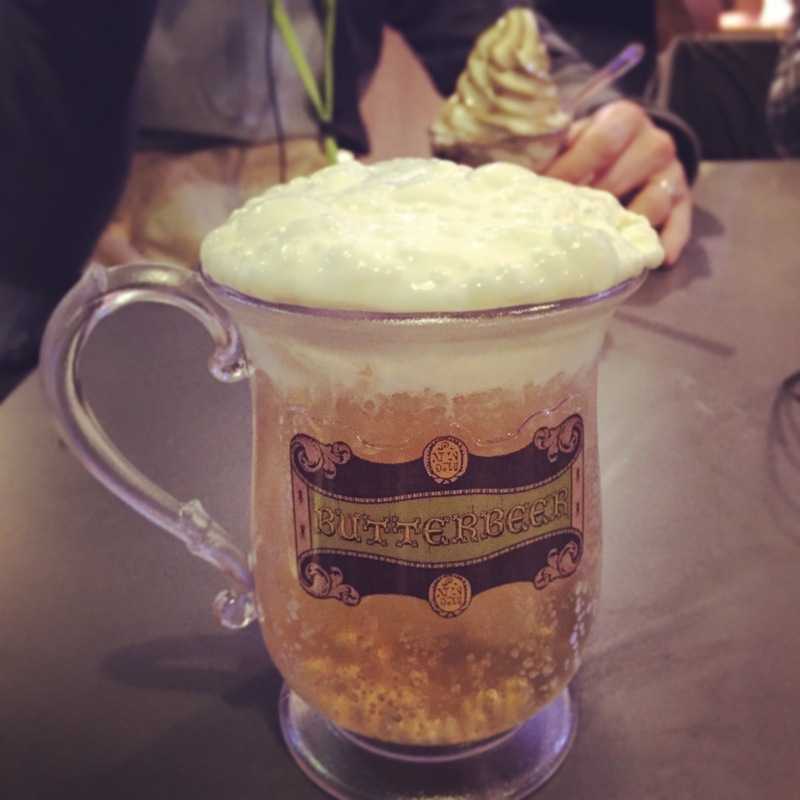 And, of course, you can order a butterbeer! It wasn’t disappointing, and the butterbeer ice cream they sell was also delicious. I don’t know how they make the bubbly topping on the butterbeer, or how they get it to bubble, but it tastes kind of like a cross between melted ice cream and whipped cream. The door to the Chamber of Secrets. Only one person in the world, its builder, is allowed to operate it because someone else tried once and broke it. And, like all good tours, it ends in a giant gift shop. Which was surprisingly lacking for socks. I really wanted a pair of Gryffindor socks, but came away empty handed footed. I think that was the only disappointment of the whole tour, though!